Good Girl Gone Redneck: Have you heard of Novica? Let me introduce you. Have you heard of Novica? Let me introduce you. Disclaimer: This is a sponsored and compensated post. I have been provided with a code to gift one of my readers directly from Novica. I have also been provided with a code for myself to purchase an item of my choosing. All expressed opinions are my own. I have ordered from Novica many times and am completely impressed with the products I have received. Because of this I choose to continue working with them and am thrilled to be introducing them to my readers. I've been fortunate to have worked with Novica several times before, and I absolutely love their products. Of course, if you know me at all, you can guess that I most especially have an eye on their jewelry. This is my favorite piece I have purchased from them. Don't be shocked - it's a sentimental thing - but I really love it and it fits perfectly. This time I'm thinking of going in a different direction with my purchase. 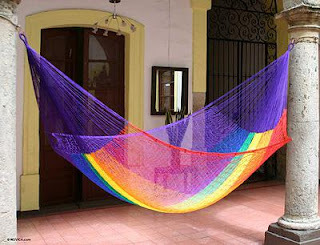 Actually, a few weeks ago I was surfing around their site and eyeing the fabric hammocks. It's 100% cotton. And it holds up to 450 lbs. Sounds good to me. I can totally picture myself curling up with exhaustion in this thing on a cool fall night. Ahhh. Oh, right, Novica. One of the things I love most about them is that they actually work with the creators of their products. They do incredible things like facilitate loans by connecting artists with lenders, help artists reach a more global market and more. You can read up on their mission by checking out their website and you'll be pleasantly surprised at how important both, the customer and creator are to Novica. Novica also carries beautiful clothing. Cotton dresses in a variety of styles, batik dresses, beautiful ponchos, and a variety of accessories to go with them. 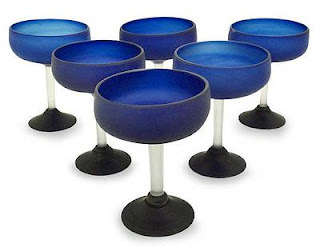 And for your household partying needs you can head over to Novica for things like serving platters (many more beautiful than any you've ever seen), margarita glasses (how fun!) and more. I think that these margarita glasses are my favorite. I kind of have a glass-related obsession, and would probably buy a glass for every drink if I had the cabinet space. As it is we have flutes and wine glasses and pilsner glasses we rarely get around to using. But aren't these beautiful? Think how much your favorite Jimmy Buffet* fan would love them! Anyway - it's your lucky day - no matter what product you choose! I'm giving away a code for $50 compliments of Novica.com. So check out the Rafflecopter below. I decided to use them today because I was too lazy to come up with ideas that would earn you entries. I promise, though, no jumping through hoops. Just simple entries that will earn you a shopping spree. So what are you waiting for? Get to it! A winner will be chosen in about a week. More details on the Rafflecopter form. Now go on and enter. And good luck! p.s. 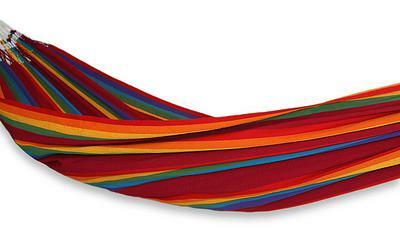 How beautiful is THIS rainbow hammock? I think this might be the one I end up getting ... now if only I could figure out where the heck to PUT one. Anyone have two huge pillars I can borrow? It might be combination of both... a gift for me... a gift for... Wait. No. It'll all be for me. It reminds me of 10,000 Villages--love the stuff, love the concept. I would love to get that hammock for my better half! So many lovely items, it is hard to choose! Buy a gift. The holidays are coming quicker than I'd like to admit. I will be buying something for myself. I will probably get something for the house. My mother's birthday isn't too far away, so I'd probably buy her a present. I would love to shop with them! I would get something for my oldest I think. A back-to-school present. I have never heard of this company before! I love hammocks. But they aren't practical for where I live right now. If I win, I will probably be looking at jewelry. Jewelry? I love sparkly shiny things! OOhhhh, so many pretty things! I would probably start out intending to get stuff for myself and wind up buying gifts instead. Christmas shopping. Okay, no. For me! I'm totally going to buy something for myself. i would get something for our house! I would buy something for MEEEE. I love the ring with the elephant on it. I want one too!! I've never heard of this company, but I will be checking them out, thanks to you. I adore NOVICA! I've purchased several things from there and they were all very high quality and I've loved the items as much in person as I did on the screen.